I love cooking with cast iron, but I know it is not for everyone. This post is going to be a little bit of overview and tips and a little bit of a guide for putting together the collection of cookware that is best for you. 0.0.2 Cast iron can be washed, but you need to be careful and dry it well. 0.3 What do I have in my collection? 1.10 Other types of cookware fill in where using cast iron is not the best idea. 1.15 Always rinse out cast iron before it has a chance for food to dry or set up solid. A lot of my pots and pans I have to use both hands to lift when there is anything at all in them. If you lack strength in your hands or arms, then you need to be careful with your choices of pans. I am not saying that you should not enjoy cast iron but double check the weight of pieces you are interested in to make sure it is comfortable for you to use. Cast iron can be washed, but you need to be careful and dry it well. You can just boil out and wipe clean your cast iron. It works just fine, and I have never experienced any issues with this, however, the myth that all soap should never touch cast iron should be explained. Soap takes away oil and oil is what seasons cast iron, so you don’t want to use it often on your iron but if you have a very messy pan and need a little extra help, it is not the end of the world if you use a little bit of soap and a soft sponge to clean it, just try not to do it too often. Rinsing your iron right after you cook something messy is a good plan. Dried on stuff is hard to get off. It took me years to actually buy these scrapers. They are wonderful, don’t scratch up surfaces and they can get rid of a lot of the grime and mess that often results in using soap on your iron. One side is rounded too so it can get into all the spaces on your round pans. Oh my, there is so much great cast iron out there. 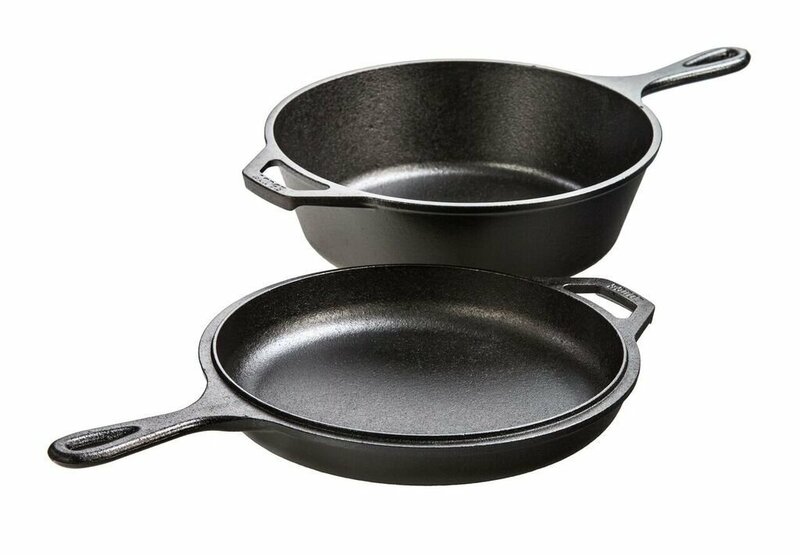 If you have a big kitchen and love cast iron then, by all means, get any pan, you want. I have a small house and a small kitchen. I cook a lot, but I don’t cook a lot of foods that require very special pans. Just ask yourself if you need the cute cornbread pan that makes little corn pieces of bread that are in the shape of an ear of corn? A standard 10 3/4 Lodge Cast Iron Frying Pan makes cornbread just fine and more of it! Dark cooking pans are not the best for some dishes. If you are making something that needs to be refrigerated after cooking, then you will want to remove it from the cast iron or use another dish. Putting cast iron in the fridge won’t ruin it, but I have to say that leaving things like moist bread or acidic foods leaves an off taste in the leftovers. I have got in a hurry and did this, but you can learn from my mistake! 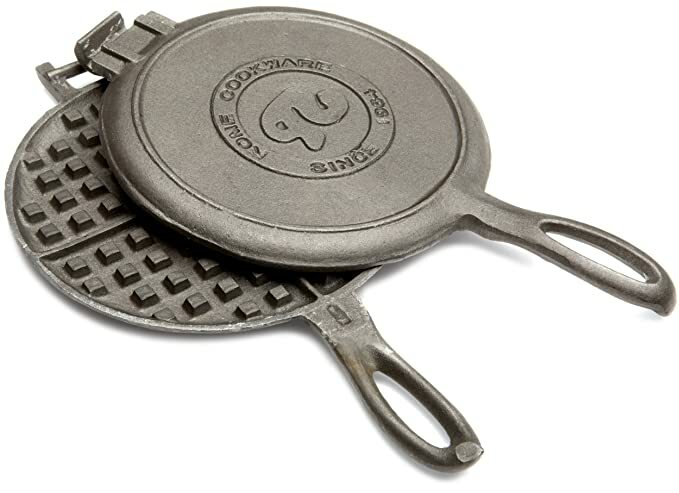 Cast iron is made using sand molds. The finer the sand, the more nonstick it is and the better the pan will distribute heat and thus cook more evenly. The cheaper cast iron is made with coarser sand. The Chinese manufactured stuff I bought and that I was given stuck more food and was harder to clean. Some people are frightened by other possible contaminants in foreign cast iron. What I bought was name brand American companies, but they had their pans made in China. What do I have in my collection? Over the years I have changed my collection a bit. I bought cast iron made in China years ago and decided that I wanted to change to American Made Lodge. I have a few other pieces, but the majority is Lodge. 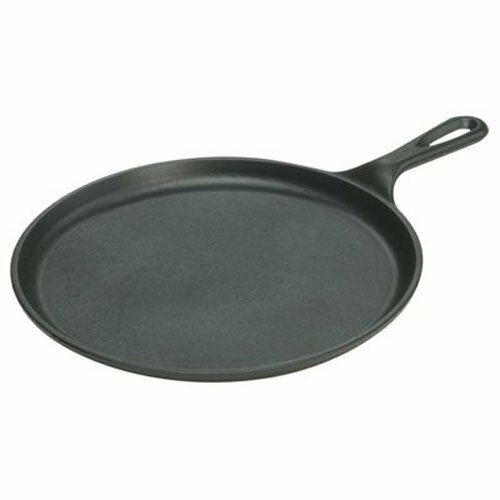 This is my choice for cast iron. It is priced well, and it is all made in Tennesee by a great company that treats their workers well. All of my cast iron is Lodge except for a pan I was bought for my birthday that is an old chicken fryer made by Wagner. They are not a company in business now. This is a great pan for large meals or frying up some veggies to put in soup. We originally bought this to do paella in over the fire outside in the vineyard but quickly found out how useful it is for stir-fries and fajita prep. I have to say this is the heaviest pan I own. There is an assist on one side so you can use two pot holders or mitts and both hands to support it on each side. At 11.5 lbs without any food in it at all, this pan can easily weigh 15 lbs when full. The 10.25 Lodge is a classic. This is the skillet size that most people have if they have any cast iron at all. I have two of them because they are so versatile and inexpensive. I can often manage to lift it full of food with just one hand, but it is still nice to have two hands on it. Unlike some brands, Lodge remembers to have the assist on their smaller pan too! This is the ideal size for making a cake of cornbread. Loaf pans are a must in my house. I use these to make homemade bread, meatloaf, lasagna for 2, and small casseroles. I like loaf pans for cooking for just two people. The size is convenient and means I don’t waste a lot of food because I cooked too much. If I want to feed 4, I can always use the second one. This loaf pan is the 8″x4″ size just to clarify. 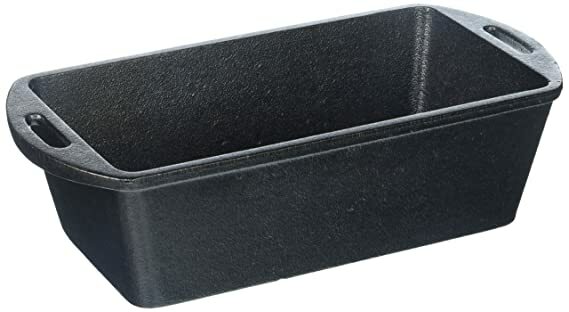 I am not aware of a larger loaf pan from Lodge but there are larger ones or ceramic lined cast iron loaf pans made in France and available on Amazon. Shop around a bit because some of the high-quality foreign made cast iron is quite expensive. The heavy shipping weight doesn’t help the cost any. The 5 qt size is great. The lid will also fit your 10.25 skillets, so that is nice sometimes. This size is big enough to feed a lot of people and will fit on a smaller wood stove so you can cook meals on those cold winter days when you are keeping the fire stoked all the time anyway! There is nothing like the smell of chili or a rich stew cooking on your wood stove, and it helps save electricity or propane depending on how you usually cook. If your house is like mine, you may find that baking in the oven and having your wood stove going is too much heat even if it is particularly frigid outside. This was originally given to us for use camping. We found that we don’t take things like this on trips because of the weight and the fact that we usually hike for a while to get to any site. For car camping or RVs, it might be okay to tote cast iron. The little legs made it so we could not use it on the stove. Matt cut the legs off with a metal saw and smoothed it out, so it is usable on a regular stove now. 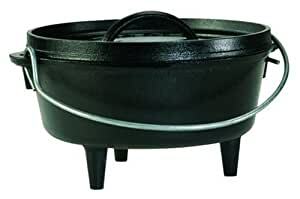 This style of dutch oven is made to sit so coals can go below it and even be piled on the lid. That is why the lid is indented rather than rounded like the larger dutch oven I own. I don’t use this pan for cooking but rather as a heat shield for the stove eye on my gas kitchen range. For things that tend to burn and stick, this is a real food saving trick. After burning too much rice and sauces, my husband suggested getting this pan and it has worked like a charm every time I remember to use it. 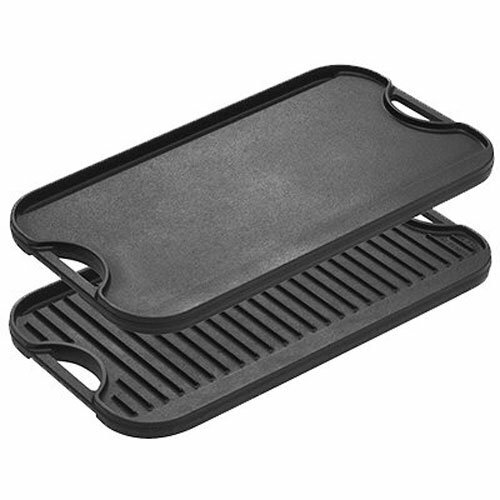 When I get busy doing a million things at once, this griddle saves the day. If you use it for actual cooking, you will find it is great for making pizza, pancakes, or frying up a few eggs. I usually just use the smooth side of this, but if you like the grill marks on your meat and the way it raises your meat for cooking, then this is a great addition to your cast iron collection. You can cook a big breakfast or 8 really big burgers on this griddle. Matt cooks us breakfast on ours fairly often. I do wipe it down with a cloth or sponge sometimes if it gets used heavily, but the plastic scrapers are great to have on hand for most messes. This was one of those cases where we really wanted a waffle maker and decided to go with one that could be used on our stove eye. Unfortunately, this one is very small, and it takes a while to make a waffle. You would need two to really make it practical for even two people. Perhaps we will find a different one later on. It would be hard to make breakfast for 4 with even two of these without having to keep some warm so everyone could eat together. Neat concept but I need a different type! We tend to eat a lot of tortillas and tortilla chips. The cost of organic corn tortillas is outrageous, so Matt and I order organic masa harina and make them ourselves for a small fraction of the cost. We line the press with saran wrap and use it that way. The iron is important because of the weight. You get such consistent results with a tortilla press. It can be used to make round pasta for pierogies too! Other types of cookware fill in where using cast iron is not the best idea. I have a full set of stainless cookware as well as some ceramic dishes. I will never use Pyrex glass because I had a dish explode on me. I am so glad my face was nowhere near. It happened as I walked out. I set a hot glass dish on a cold stove top (it was a convection oven at a rental house when I was in my early 20s). I recommend a mixed collection of cook wear if you cook at home a lot. Matt and I eat 99% of our meals at home. Eating out is not something that we do very often. There is nothing wrong with used cast iron, but it can take a little work to get it back into shape. Seasoning cast iron is not hard, but you have to take some care to avoid getting burned. 1. Lightly brush off and remove any rust or debris. Do not use anything too abrasive like steel wool or a wire brush. Usually just a sponge with a green light scrubber on the other side. 2. Heat the cast iron until very hot. It might start smoking even. Usually, we use an old clean white cotton rag and rub some oil on it. We use lard that we render or other high heat tolerant oil. If you can get the back that is good too. We often do our cast iron seasoning outside in a woodfire so we can avoid the smoke and we can throw it around a bit and season a lot at once. You can get it very hot in a wood fire and make a bit of an event of it. This major seasoning does not have to be done that often. It is mostly for when cast iron has never been seasoned or has been neglected. The most expensive cast iron in my collection is a chicken fryer made by a brand that no longer exists. I got it as a gift for my birthday from a neighbor and I love it but I know that it came from a store that has a lot of heirloom cast iron like $250 bundt style cake pans that are 75-100 years old. If a pan doesn’t have a mark or name on it, then it can be hard to tell the age and overall quality. Some people love the old stuff with a history behind it but for everyday use and going easy on the budget, buy new Lodge cast iron or similar but still keep your eyes out for a good deal at a yard sale or second-hand shop because sometimes you get lucky! If you want a chicken fryer too then here is the Lodge version. 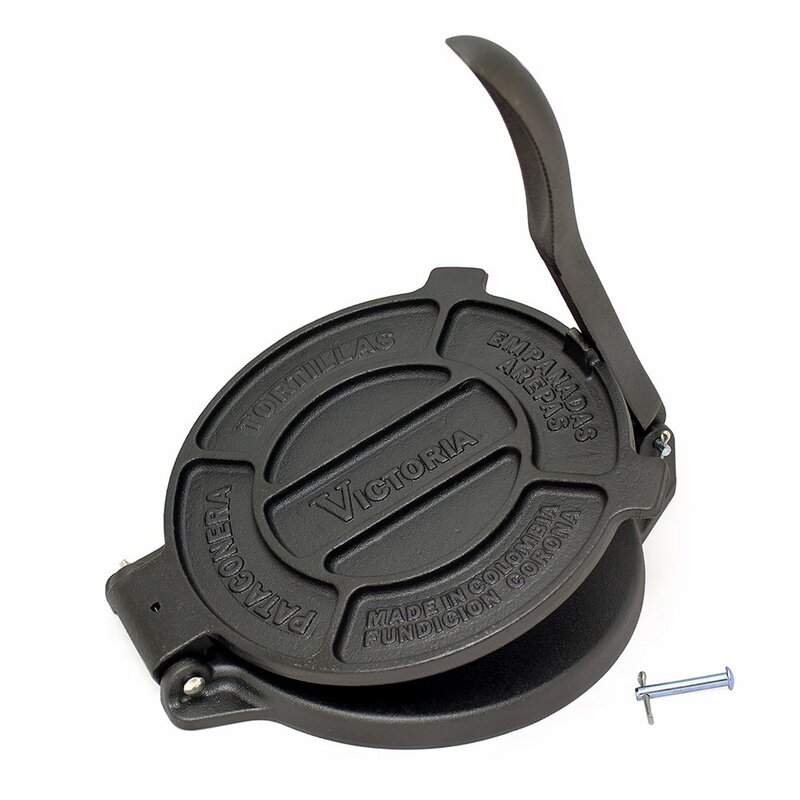 This chicken fryer also comes with a lid you can use as a griddle, so it is an exceptional deal! 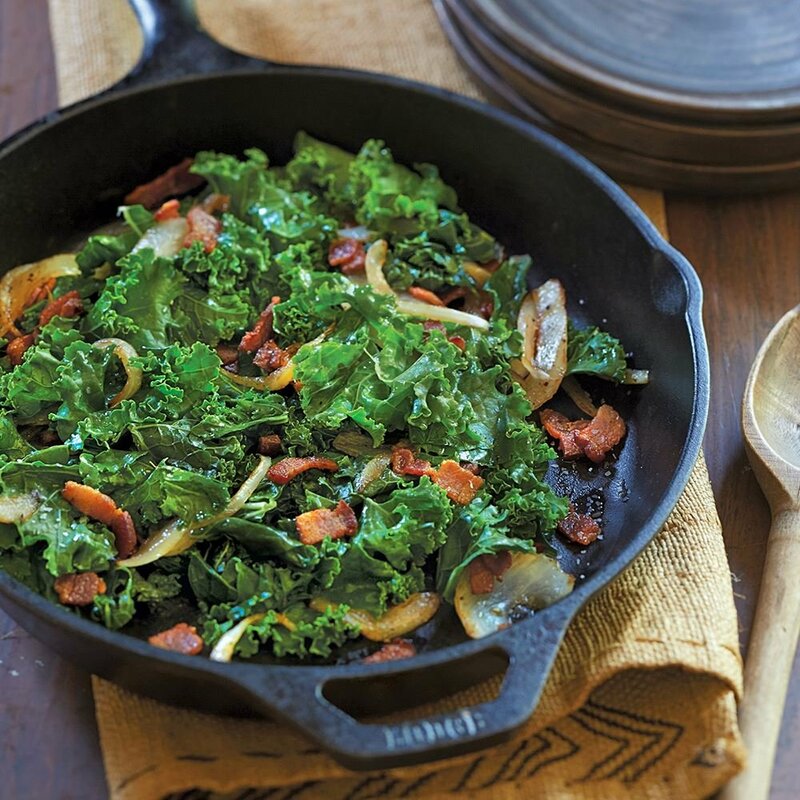 Unless things have changed at Lodge, the lid should also fit your 10.25-inch skillets. Cast iron can cook a bit hot, and it will keep cooking for a while after you turn off the heat. This means you need to be careful about cooking times. Some of you may have read my article on roasting coffee at home. Well, we still roast all of our own coffee, and it is always done in a cast iron skillet. Sometimes we use the 15 inch and sometimes the 10.25 if we are in a hurry and don’t want to roast the amount of coffee that will fit in the 15. I have never noticed any heavy coffee taste in food after we have used it to roast coffee. 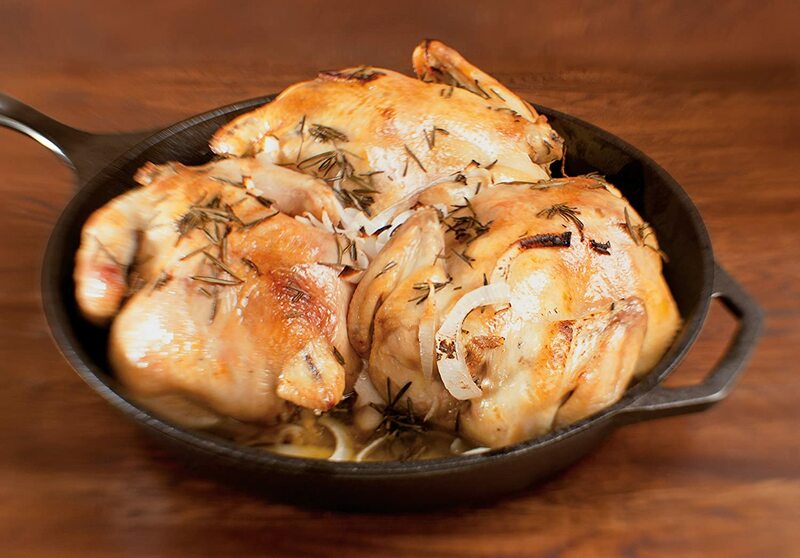 Always rinse out cast iron before it has a chance for food to dry or set up solid. Cast iron is so much easier to clean if you can get it rinsed out before cheesy or goopy stuff has a chance to congeal or dry. I have been the one to let this happen, and it always takes three times as long to clean when I do. If it happens, don’t fret too much but try to avoid it when you can. What do you have in your cast iron collection? Am I missing something that I should add to mine? At the moment I want to get the Lodge Cast Iron Wok. I used to have an off-brand cast iron wok and made frying so easy and it used so much less oil than other cooking methods. My wife recently bought a Bayou Classics long-handled 1 quart cast iron sauce pan with lid. One of the most useful items in our kitchen. Great article on cast iron!